Los Padres National Forest officials announced today that Cherry Creek Road (Forest Road 6N01.1) on the Ojai Ranger District will re-open Thursday morning, August 1. Cherry Creek Road has been closed since December under a seasonal closure as stipulated by the Motor Vehicle Use Map. Cherry Creek Road extends for three miles off Hwy 33 and provides access to the North Fork Matilija Trail and the Ortega OHV Trail. The public is reminded that recreational target shooting of any kind is currently prohibited in Los Padres National Forest, including Cherry Creek. The Reyes Peak Road (6N06) used to access Pine Mountain and Reyes Peak Campgrounds as well as Reyes Peak Trailhead remains closed pending the completion of road work. Officials estimate that Reyes Peak Road will re-open to the public on Friday, August 30. The road was damaged in the 2007 Zaca Fire as contingency fire lines were constructed. The road work includes grinding asphalt, base placement, paving and installation of spillways. In an effort to enhance public safety, there has been no public access of any sort, motorized or non-motorized, while work crews complete this critical work. Road work will stop at Reyes Peak Campground, which is closed to public use. The public may use Chorro Grande Trail (23W05) to access the south side of Pine Mountain, and then turn east (right) on the last mile of road which will not be involved in the road work. This moderately difficult trail allows access to the Reyes Peak Trail (23W04). Visitors are reminded that current fire restrictions prohibit campfires of any kind inside Los Padres National Forest. Cooking stoves may be used at established Campfire Use Sites only. A list of Campfire Use Sites is available on the Los Pades National Forest website at http://www.fs.usda.gov/lpnf. Visitors are strongly encouraged to plan ahead, come prepared, and contact the District Office in Ojai for the latest conditions by calling (805) 646-4348. The office is open Monday through Friday from 8:00 am to 12:00 pm, and 12:30 pm to 4:30 pm. 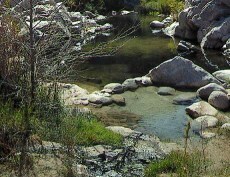 Additional information is also available on Los Padres National Forest website at http://www.fs.usda.gov/lpnf.